So you skipped booking any Thailand tours and you’ve decided to try to figure out things as you go. Catching a taxi from the airport to the hotel shouldn’t be that difficult, but there are a few things that you should be aware of before you leave the terminal. A taxi ride to the center of Bangkok should cost somewhere between 250-500 baht based on a number of factors including distance, traffic conditions, tolls (we’ll get to this later) etc. Why is this important? Well, many taxi drivers either don’t carry small change or will tell you they don’t because they are hoping you will let them keep a large note. So if you don’t have small bills, the first thing to do is to head over to the currency exchange. You want to make sure you have a reasonable supply of 100 baht notes and some 20 baht notes as well. The other option is to head over to an ATM to get some currency. Most ATMs will dispense 100, 500, and 1000 baht notes with a limit of 20 notes. So the largest amount that you can withdraw that still includes 100 baht notes is 15,900 baht. Also be aware that most ATM’s charge 150 baht for using foreign cards. But say you don’t have small bills, maybe you were so tired and jet lagged that you just wanted to get to your hotel and completely forgot about getting small bills. Well, you have one other option. If you end up taking the toll highway or expressway, the toll booths will be able to exchange 1000 baht notes for smaller bills. Unfortunately, the signs don’t warn you to look out for touts. Almost immediately after you exit you will be greeted by a swarm of touts offering limo/taxi services to get you to your hotel. The rates that these touts charge can be 2 to 3 times more than you would have ended up paying if you just took a normal taxi. Just politely decline all of their offers and make your way to the taxi desk. Once you are at the taxi desk, give the dispatcher the name of your hotel or address of your destination. **DO NOT** Ask anyone how much because that implies that you would rather pay a flat fee instead of using the meter. The dispatcher may give you a YELLOW piece of paper with your destination on it. This paper is for your driver. Take it over to the queue of taxi drivers and hand it to the supervisor. 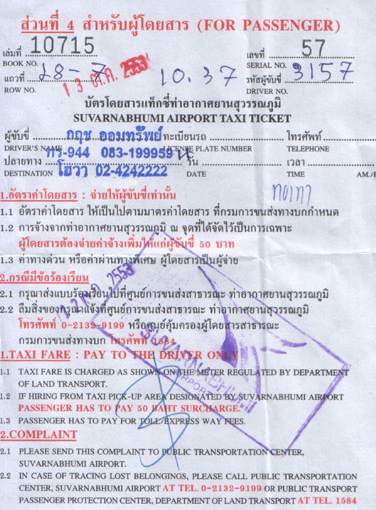 The supervisor will exchange it for a WHITE piece of paper that has your taxi driver’s name on it along with other information such as the 50 baht airport surcharge that you add to the fare when you reach your destination. **DO NOT** Give the WHITE paper to the driver. The driver has all the information he needs. The WHITE paper is in case you have any problems, forget luggage etc. Once get in the taxi, make sure that the driver starts the meter and that it shows 35 since Bangkok taxi meters start at 35 baht. If you want to take the toll/expressway, you will have to pay extra. As of 01 Sept 2013 the tollway charges are 25 + 50 = 75 baht. So the total price when you arrive at your destination will be the amount shown on the taxi meter, plus the 50 baht airport surcharge, and any toll fees incurred from using the toll/expressway. Hopefully this guide was helpful to you. If this seems like too much, another alternative is to use the Airport Rail Link train system. You can use the train to get to central Bangkok and then take a taxi from there to get to your final destination. Here is the guide on how to use the Airport Rail Link train system.